Just inside the Château de Caen, a modern building houses the fine arts museum. 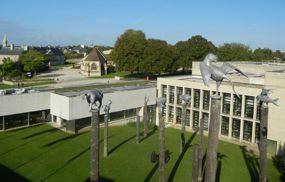 The Musée des Beaux-Arts, or Fine Arts Museum, is on the grounds of the Château de Caen, allowing the visitor to experience both the château-fort and beautiful art. The permanent collection is known for its 16th and 17th century European paintings, particularly by French, Italian, and Dutch masters. It also includes works from the 18th century and later. Special exhibitions may feature modern artists. 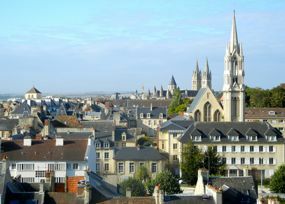 View of Caen from the Château ramparts. The museum has a café and a roof terrace where you can have a coffee or lunch at the same time as you are enjoying the views and the sculpture garden. While you're in the Château, you can also visit the ramparts and the Musée de Normandie.